So was it a melon? The object WAS a melon but when we tasted it - it tasted of nothing - not sweet and juicy like the ones grown in the greenhouse. 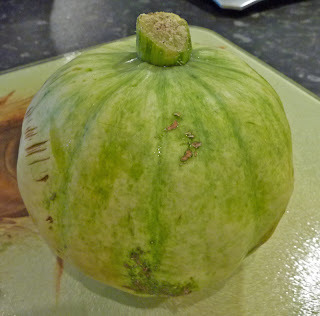 It had changed from the really dark green colour and was fairly soft and looked quite juicy but obviously hadn't ripened properly. 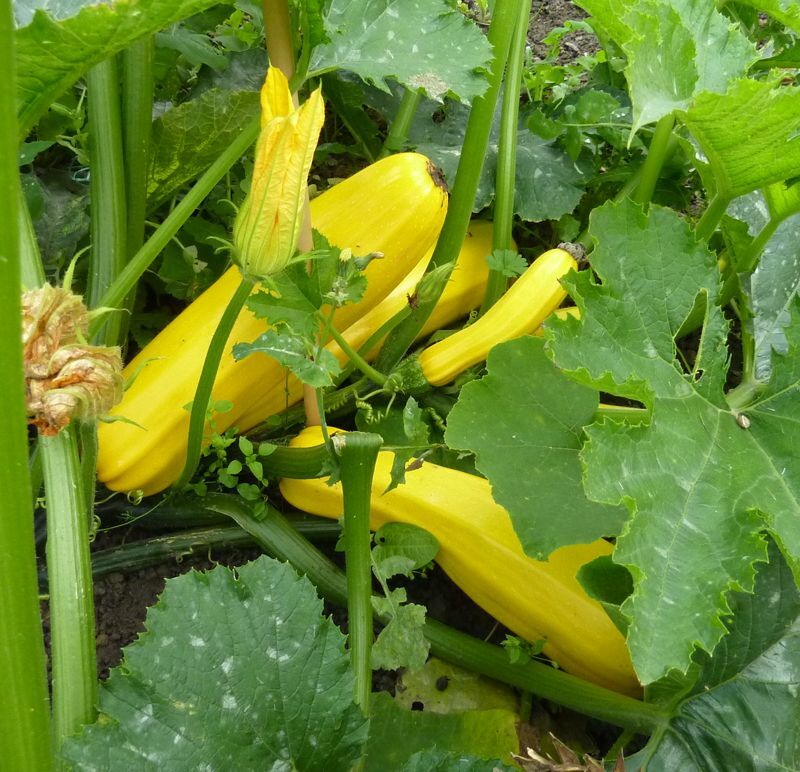 The fruit was found hidden amongst the squash plants so it wouldn't have benefitted from the limited amount of sunshine that we had over 'summer'. Maybe this meant that the fruit hadn't sweetened. Anyway next year we are going to have another try at growing melons outdoors this time with a bit more tender loving care as at least we now know we can get fruit to develop even during the abyssmal summer that is now just a memory! 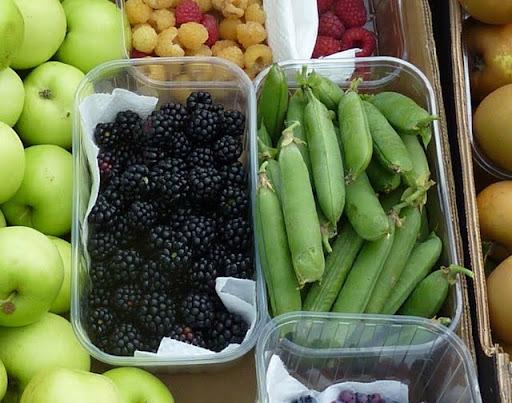 Unlike some of you we haven't placed entries into local shows so the title of this post doesn't refer to prizes gained from wonderful fruit and vegetable but instead to two crops that are firsts for us. Number one first - we picked a whole punnet of cranberries. 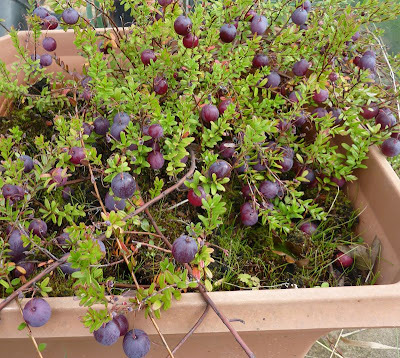 We have two tubs either side of the plot greenhouse door each planted with a cranberry bush. Originally these were planted between the blueberry bushes but the sprawling habit meant that it was difficult to weed around them and they became a tangled mess so last year I moved them into tubs. Strangely one plant has been loaded with fruit and the other didn’t even manage to flower (I think it produced one lonely flower). The flowers are really pretty. 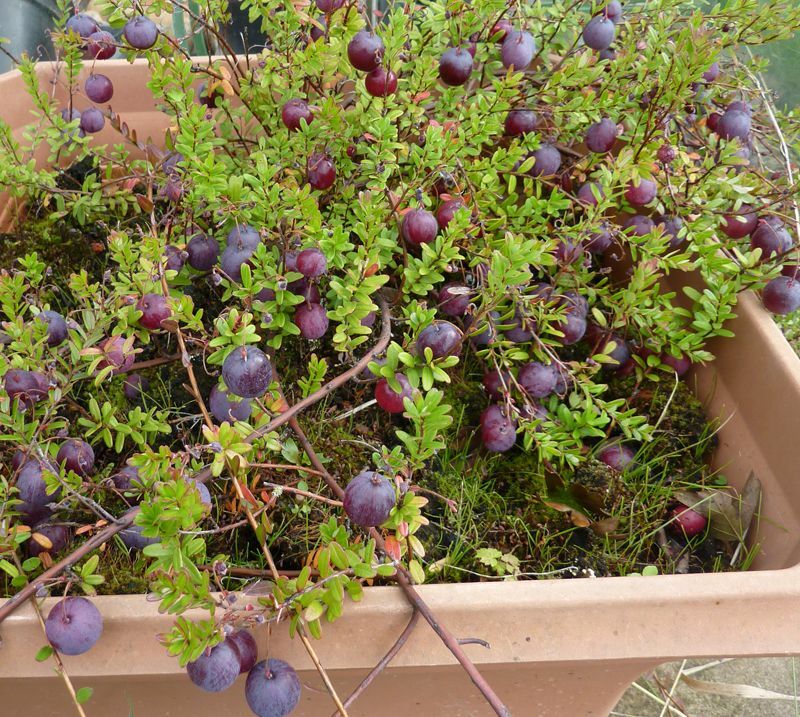 I found it really tricky deciding when to pick the berries so this year I left them on the plant for as long as possible and this week managed to collect a punnet of dark burgundy cranberries which were stewed and eaten with yoghurt. Our second first﻿ (can I have a second first?) 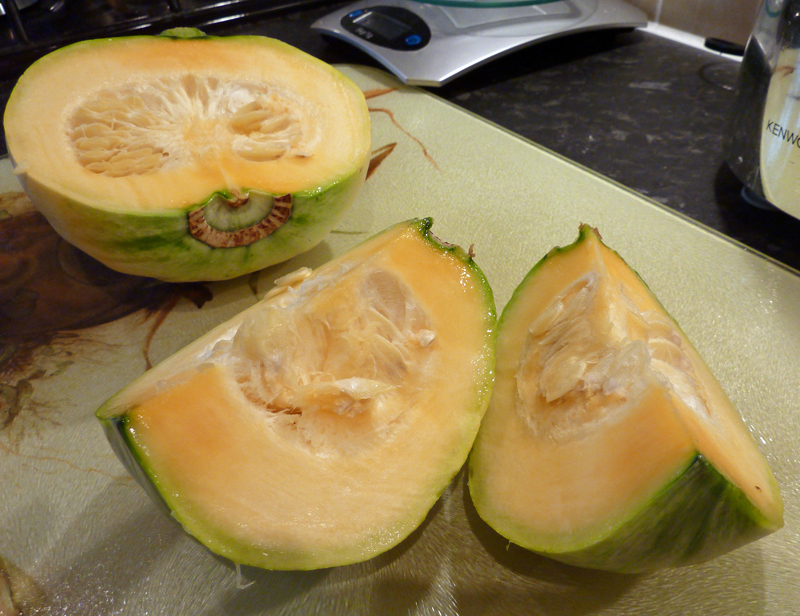 was to pick a fully ripe home grown melon. 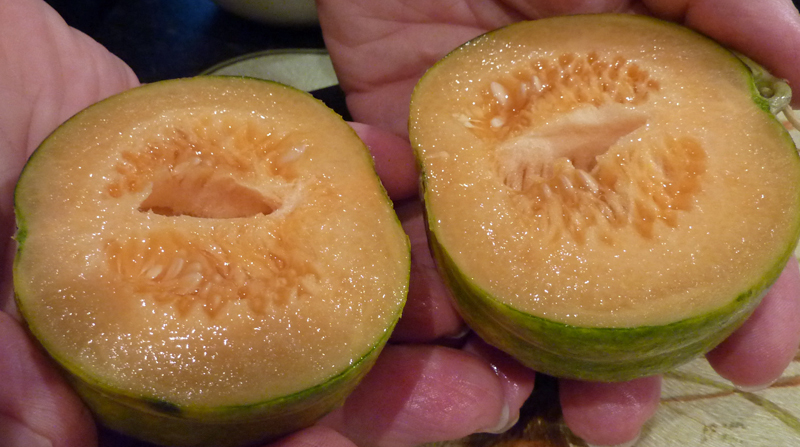 We grew Noir des Carmes said to be one of the easiest melons to grow. 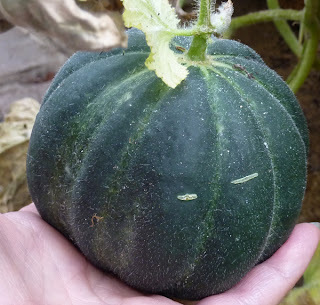 This was planted in a tub in the greenhouse and has managed to produce three smallish melons - not many but everyone has to start somewhere. I also think they should have been a bit bigger but the plants were left to fend for themselves amongst the tomato plants. The fruits start off very dark green. 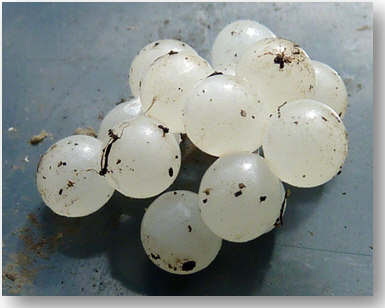 and become paler when they ripen. Even from a photo I think you can tell how juicy it was! 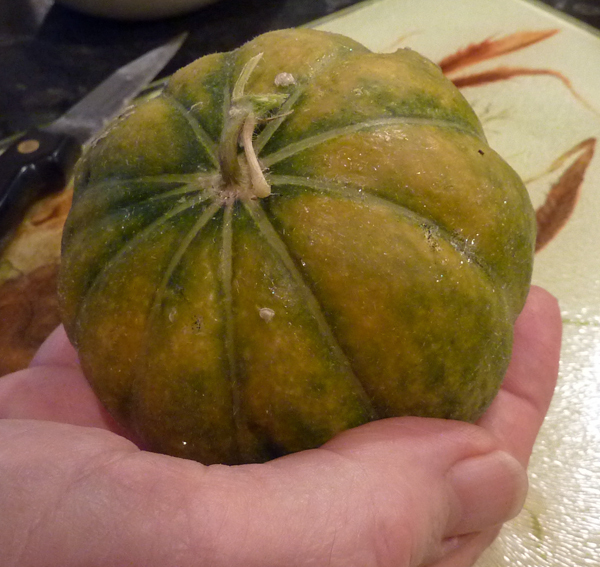 It didn't look like either of the squashes that we grew and the plant had leaves that looked like a melon ... but this fruit doesn't look like the melons in the greenhouse ... and is a bit bigger too. 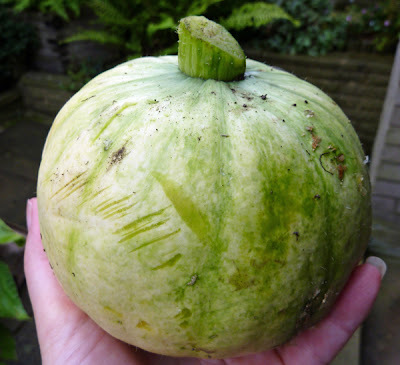 We sort of seem to remember planting a spare melon plant outside on the plot rather than throw it away but then forgot about it! So is this a melon? We don't want to cut into it today so you'll just have to wait until tomorrow for all to be revealed. I've posted last weeks' diary entry on my website here along with last week's photo album here. If you want to view either just click on the links. I'm not the sort of person who wins things so imagine my surprise when posted on Damo's Two Chances blog was a list of winners of a competition that he had organised and I was on it! My prize was a gift voucher for Lands End. 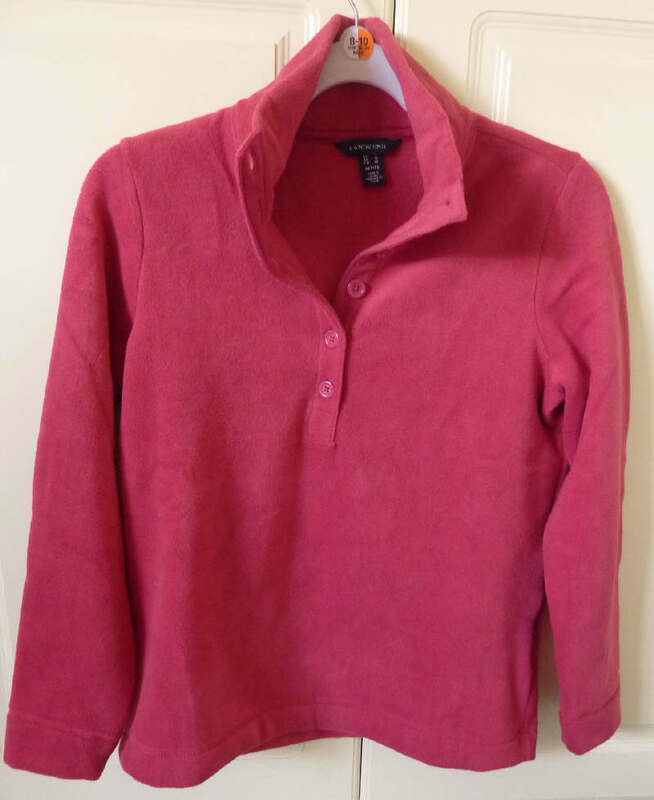 No I didn't win a section of southern England but I did use my voucher to buy a fleecy top - hopefully it will keep me nice and warm through winter. I also received some packets of nasturtium seeds that I will share with friends. Thanks Damien for the nice surprise and Chloe for pulling out my name and making me one of the winners! After a week away ...? We managed our first visit to the plot after our holiday so what did we find? It's obviously been windy as one runner bean teepee has been blown over and other things look windswept. There were even some strawberries ready to pick. 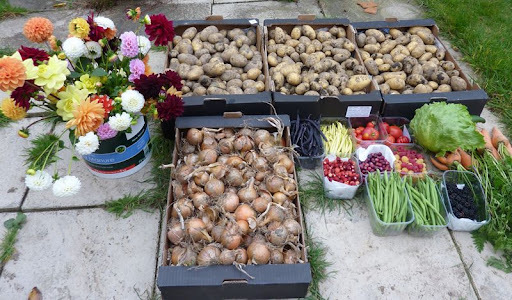 As well as lots of other things to harvest. All in all things seem to have survived! A week away from it all? We spent last week on holiday in the Cotswolds. We rented a 'cottage' in the village of Apperley which is near to Tewkesbury and was ideally placed for us to explore part of the Cotswolds. 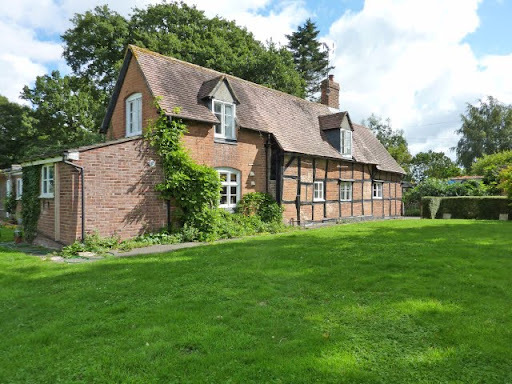 The 'cottage' was a Grade II listed building with a quarter acre of land. This was mainly left to grass. We﻿ were very lucky with the weather as any rain fell later afternoon or evening after we had returned to the cottage so we were able to visit quite a few of the picture postcard Cotswold villages and also manged a visit to Hidcote Manor. We had heard so much about it the we couldn't stay in the area without paying a visit. Although we arrived back home on Saturday, Sunday was a miserable day so we didn't manage a visit to the plot so have no idea of how things are doing after a week of neglect but things are continuing to ripen in the garden greenhouse. There are also new flowers in the garden and lots of berries on the pyracantha which will no doubt soon be enjoyed by the birds. So we haven't really been missed - except maybe by the fish! Just a plea for advice really. I want to buy a book on either growing fruit and vegetables in containers or in a small garden amongst ornamental plants. If I can find one that does both all the better! The book needs to inspire someone who has never grow their own vegetables and give good information with good pictures to make it a book that you want to browse. 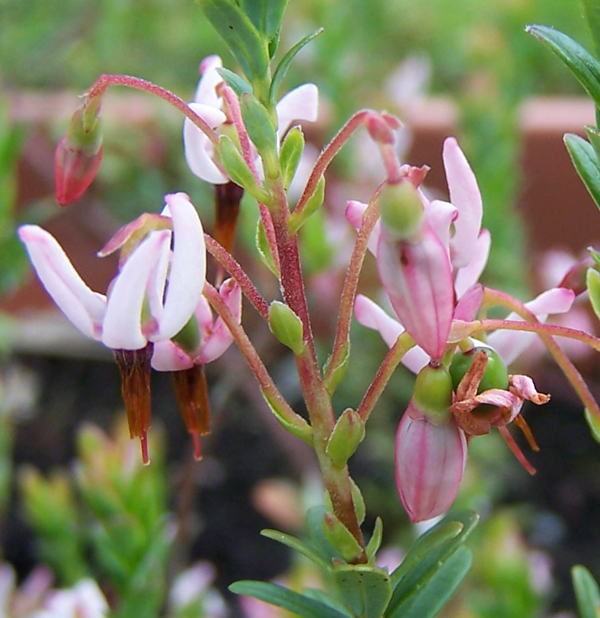 Do you have or help in a school garden? 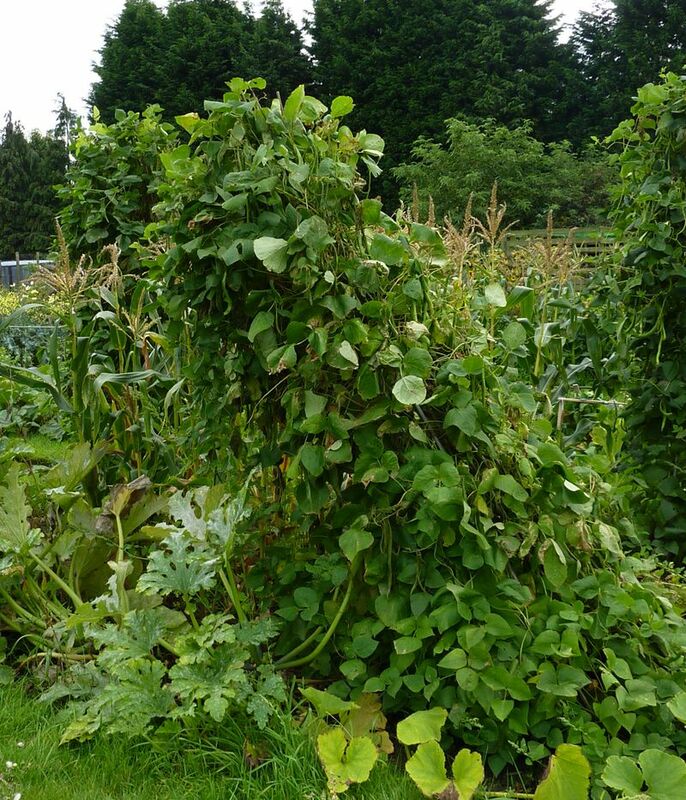 You may have already visited my School Vegetable Patch website and blog. I know from visiting other blogs that some of you work in school or help out with a school garden. On my website I'm trying to post articles about existing school gardens - especially vegetable gardens. Schools seem to be very shy of sending in information but I do have two examples sent in by a fellow blogger - Liz aka The Nutty Gnome If you can help by encouraging your school to send in something similar then that would be just great. Just email me so we can have a 'chat'. They came good in the end - well sort of anyway! Maybe not quite as many tomatoes as some of you have harvested but at one point it seemed that we may not get any red (or yellow) tomatoes so we are happy with this lot and there are still more to come. You may have read before that we have had problems with our tomatoes this year. The ones in our plot greenhouse have been a total disaster with all our successful cropping coming from the garden greenhouse. Both lots of tomatoes were grown from the same seed with some plants being planted in the plot greenhouse and others in the garden greenhouse. The only difference really was the compost that was used once they were potted up. The tomatoes in the garden greenhouse were planted in growbag compost and those on the plot in a multi-purpose compost from a local garden centre. We sowed twelve varieties of tomatoes, some through choice and others because we acquired packets of seeds free with magazines. (You can't just leave them in their packets can you?) 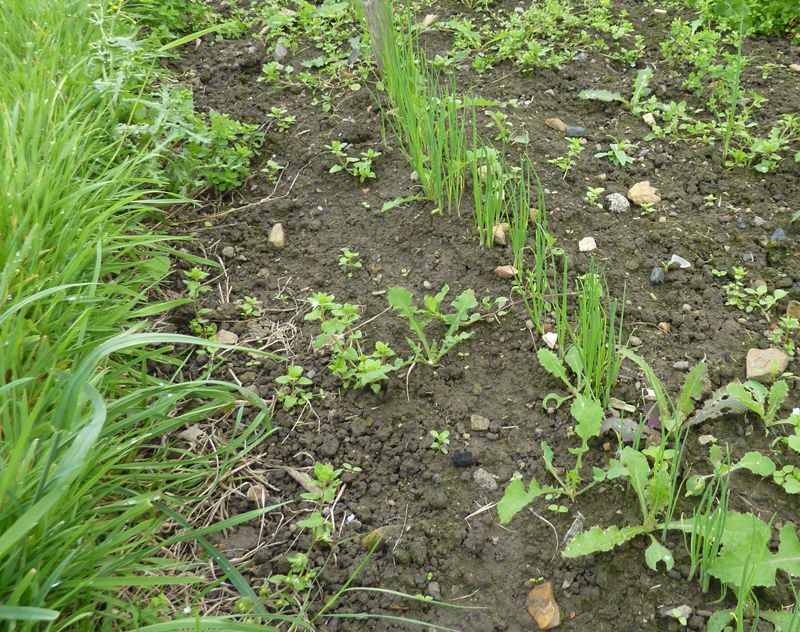 The varieties that we sowed are listed on a spreadsheet on this page of our website. We have grown some of the failed varieties successfully before but this year some even failed to germinate so again the only thing we can think to blame is poor compost. The photo above shows our most successful varieties. The large orange yellow one is Amish Gold (this had a really good flavour), the yellow one is Yellow Perfection, the one on the top left is Brandywine (a fairly small one as this variety can produce monsters like this one that we grew last year), next to that is Costoluto Fiorentino (the convulutions make this tomato a bit awkward to use especially the smaller ones), the small tomatoes are Tumbling Tom and the remaining one is Moneymaker. Another problematic crop this year has been our pea crop. 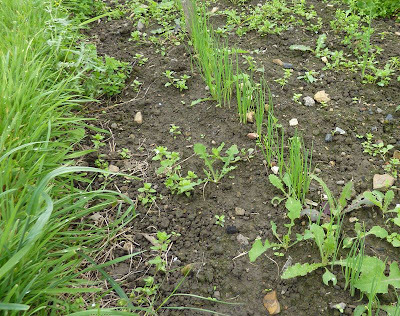 This time it was more the weather than the compost that seemed to have been against us - I also suspect that something had nibbled any pea shoots that managed to break through the dry soil. The first sowing was fine but after that it was a battle. Last week a late sowing of peas actually managed to produce a small crop. It may have been small but the peas were a treat and not a maggot in sight. So what would you do if this suddenly appeared in your kitchen. Our first reaction was to run - no not away - for a camera. I tried to get a photograph but the thing moved far too quickly and being on a window the camera wanted to focus on something outside. Martyn did however manage to get this bit of video. After a bit of research I think this is a wood wasp. Apparently she is totally harmless. The thing that looks like a hyperdermic needle ready to give a nasty sting is actually her egg laying tube! (That's why I referred to her as she - the male unsurprisingly doesn't have one). After being a reluctant star of our film we bravely set her free outdoors. I say bravely as at the time we didn't know she was harmless. The second half of the film clip is a repeat of the first bit but has been slowed down so that you can see the creature better. As it turned out - not the best place to leave your babies! 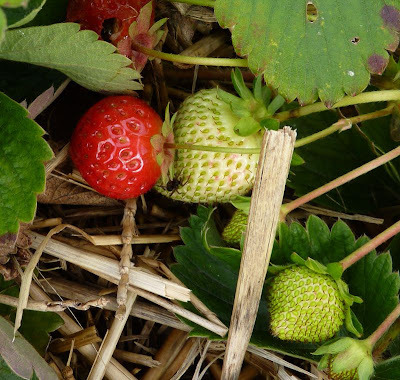 Early in the year we sowed some alpine strawberry seeds in modules. We like to keep renewing our alpine strawberry plants to ensure that we have a good crop of tiny strawberries every year. 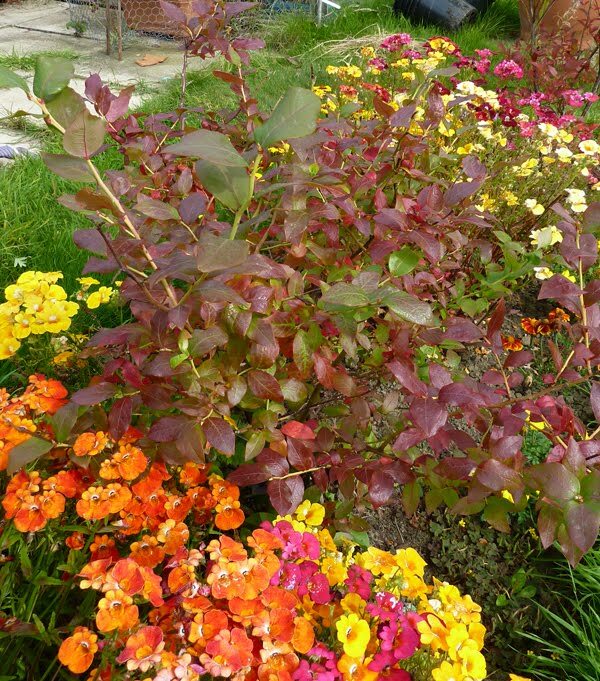 The young plants had grown well and were ready to be planted out on the plot. When removing one plant from the modules I couldn't fail to notice lots of small pearl like eggs. They are either slug or snail eggs but my money is on snails as there was a snail tucked under the rim of the tray containing the cells. It would have been fascinating to allow the eggs to grow on so that I could show you what happens but I didn't have anything on the plot that I could use to do this so I'm afraid the eggs are likely to fall victim to the resident blackbirds. 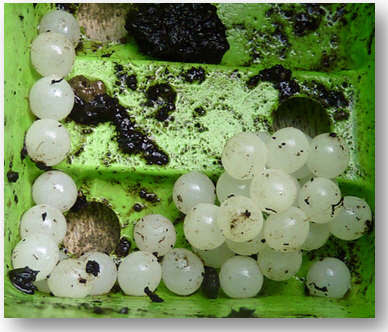 Each snail lays about 100 eggs and what's more every snail lays eggs as they all have both male and female parts so I'm sure that the loss of this batch will do nothing to decrease the snail population - more's the pity! 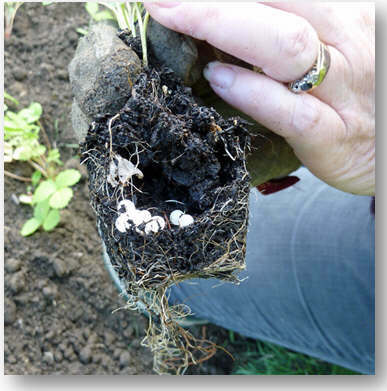 I have written articles about both snails and slugs on my website if you want to read a bit more about their life cycles or view the videos that we have taken of them in past years. Have we reached the turning point? September is in many ways a turning point in the year. As Martyn wrote in his weather diary blog in meteorological circles it marks the start of autumn. The blueberry bushes seem to agree as the leaves are turning a vivid red although we are still picking a smattering of berries. 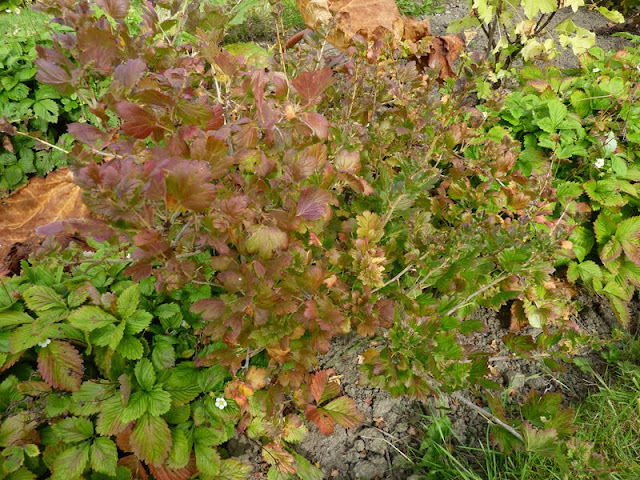 The gooseberry bushes too are preparing for a well earned rest. And its not only the leaves that are turning - we picked our first red pepper - Jimmy Nardello. 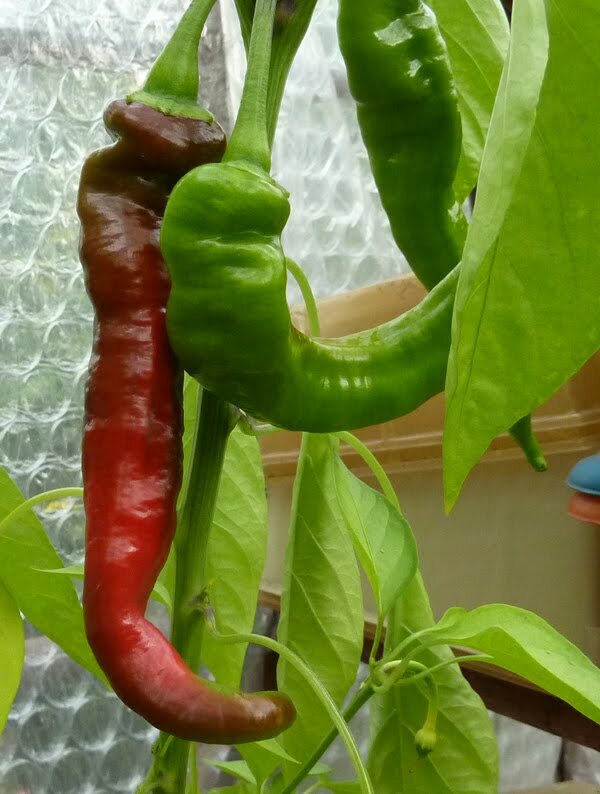 It looks like a dreaded chilli pepper but isn't! This year we have grown this variety and an upright carroty sort of shaped one called Tequila Sunrise which should ripen to an orange yellow. So far these seem to be giving better results than the bell peppers grown in previous years - or maybe we have just looked after them better! 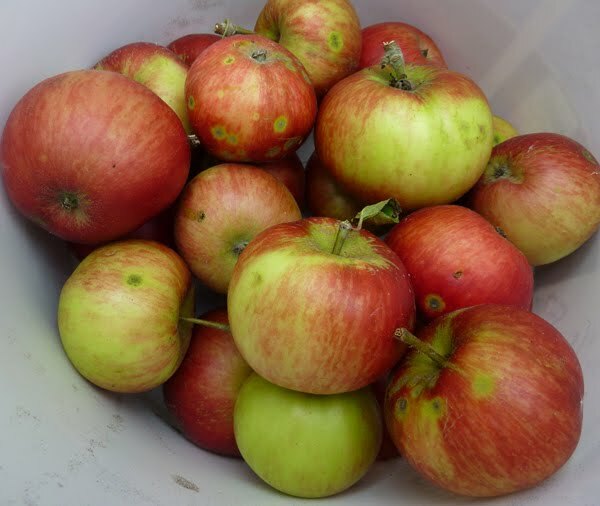 We have picked our first apples which we think are Discovery. The apples have a lovely pink tinge to the flesh. They were on the plot when we took it over buried under grass, brambles and goodness knows what else which is why we can only guess at the variety. 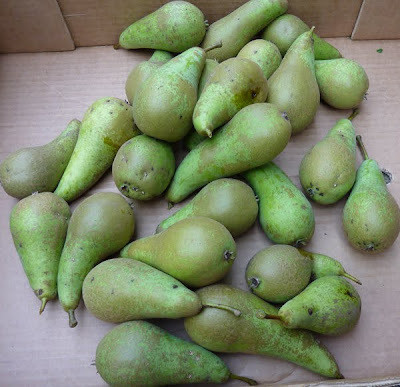 The Conference pear in the garden has started to shed its fruit - the ones above are windfalls. The bruised fruit is being stewed. The fruit on our new pear trees will need to be picked and allowed to ripen off the trees. 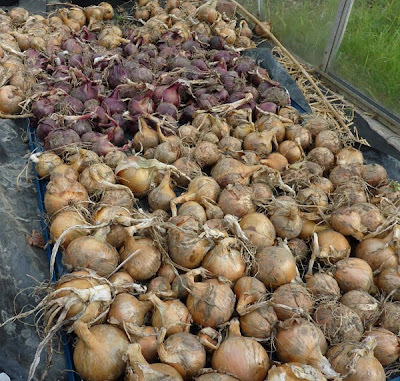 Onions are now all lifted and drying off in the plot greenhouse - no point leaving them outside just in case the rain undoes all the good work. 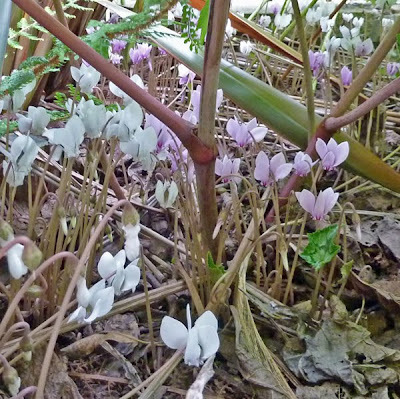 And just look what I found in the garden flowering away under some rogersias - there are also some of these hardy cyclamen pretending to be snowdrops - they are growing just where the snowdrops will be in spring. 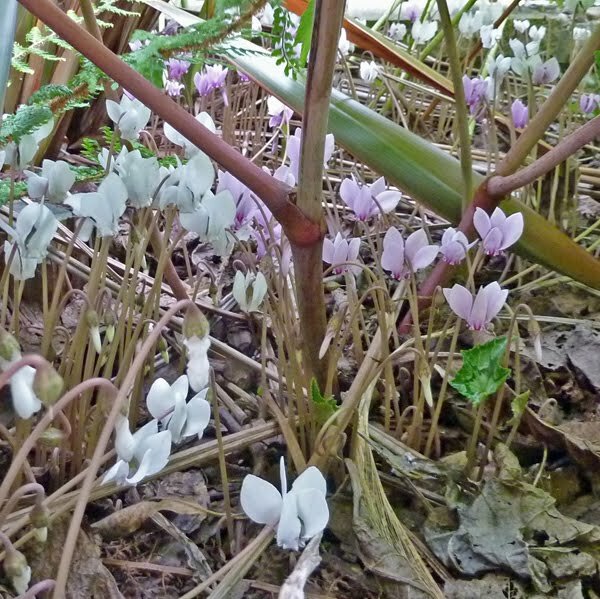 We started with only a couple of corms - one pink and one white and now not only have mini cyclamen popping up all over the garden but some have also managed to make it to the plot. Somenow have corms the size of dinner plates. When is a wasp not a wasp? It's not only the bees that simply adore our cardoon and artichoke flowers. Lots of hoverflies come to browse the flowers too. These flies are pretending to be wasps as a defence but it is no defence against humans who have a pathelogical hatred of wasps! 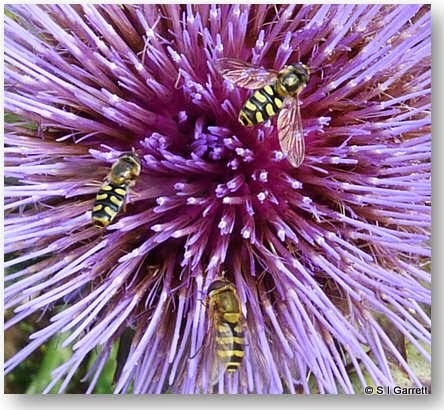 There are over 250 varieties of hoverflies. I'm hoping these are Syrphus torvus as their larvae are aphid crunchers! They don't seem to have a more user friendly name but apparently have hairy eyes and these seemed to have just that - if you wonder how I came to that conclusion then visit my website to read a bit more. 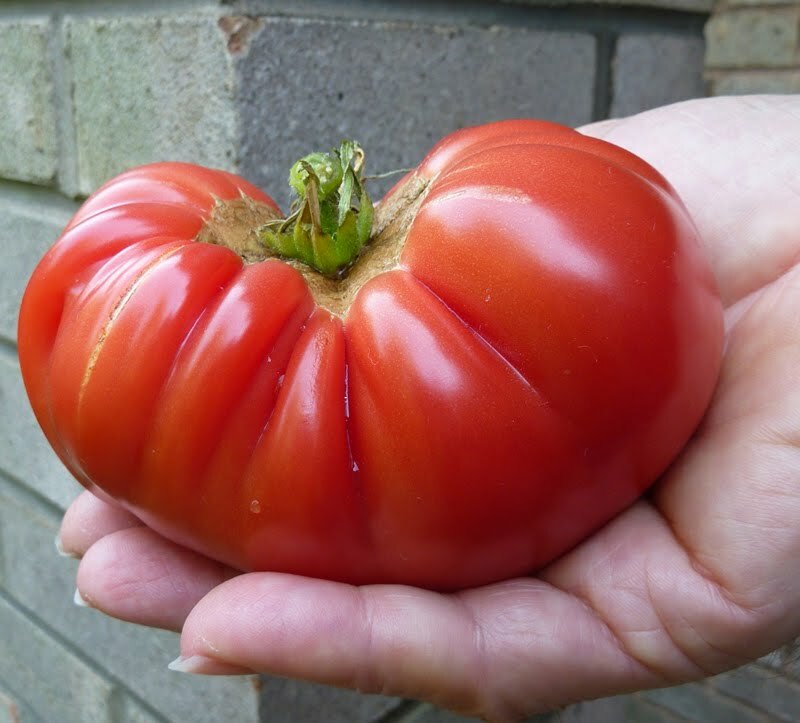 A few posts ago I had a photo of a weird tomato growing on our costoluto fiorentino plant and I promised that I would post a photo when it was cut open. Well the dreadful deed is done and our weird tomato is sadly no more. Taking a photo was going to pose a bit of a problem as the tomato is (or I should say was) such a contorted shape - so we resorted to filming the dramatic moment. We decided that we would use the tomato in our lunch-time sandwich but after viewing the video you will understand why we had to rethink and use the tomato when cooking dinner. Apparently a translation from Italian to English reveals quite an appropriate name for this variety of tomato 'ribbed florentine'. Most of the other tomatoes live up to this name perfectly but this one well maybe you can think of an appropriate name in either Italian or English! 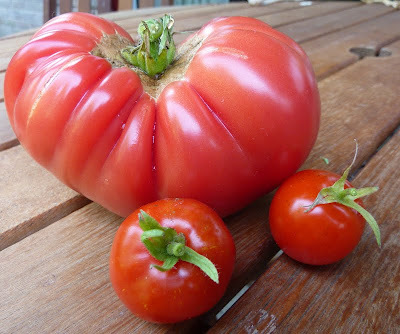 Another couple of varieties harvested were Brandywine and Tumbling Tom - the little and large of our tomato crops. Even this 'small' Brandywine proved equal to the task of filling this man-sized sandwich. 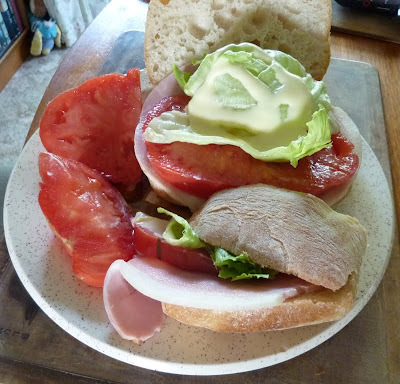 It even managed to fill a woman sized sandwich too with a few bits on the side!